CopyMask2Layer works with masks on any 2D layer. 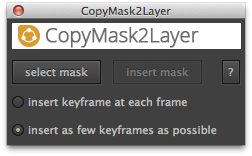 Version 2 of CopyMask2Layer natively supports rotobezier masks. It is always frustrating when I paste a mask and it has scaled or done some other unanticipated change. I'll look forward to seeing how it will impact my workflow. Jeff Petersen during his beta tests. Upgrade Notice: If you bought CopyMask2Layer 1 after July 6th, 2013 you can upgrade for free otherwise you can upgrade for a 50% discount. Make sure you are logged in to the same account under which you bought v1 to see the special upgrade price. Contact support if you have any questions.